Call, write or email. Either way, we're here to help. Need to contact Hearst Castle? Browse through our list of contacts below for tour reservations and cancellation assistance, in addition to media/press contacts, lost and found inquiries and more. 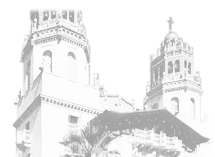 Please note, Hearst Castle Tour tickets can also be purchased online up to 60 days in advance. If you can’t find an appropriate contact above fill out the form below and we will do our best to route your request to a staff member that can help you with your problem or question.